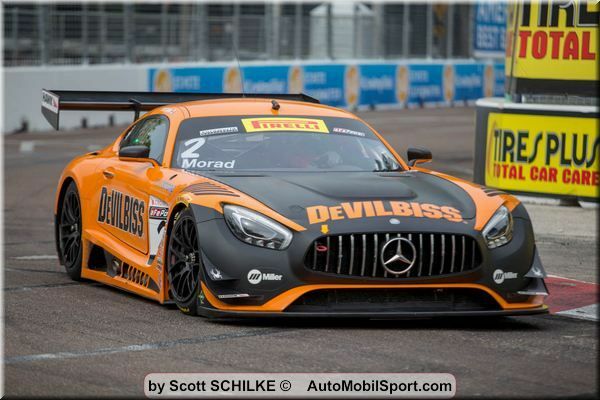 Mercedes-AMG Motorsport Customer Racing teams in two different Pirelli World Challenge classes showed well in this past weekend’s season-opening St. Petersburg Grand Prix. Driver Daniel Morad piloted the No. 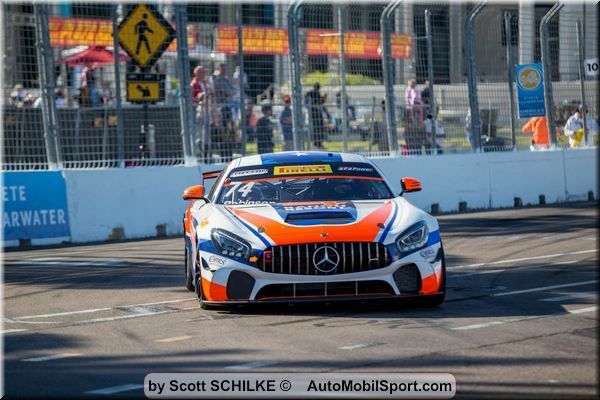 2 CRP Racing Mercedes-AMG GT3 to third-place finishes in the top-tier Pirelli World Challenge GT class in sprint races on both Saturday and Sunday. Stepping into the full-season driver role in 2018 after debuting with CRP Racing last year in Pirelli World Challenge SprintX competition, Morad was competitive from the onset of Friday’s first practice sessions on the challenging 1.8-mile temporary street course. After qualifying fifth earlier that morning, Morad charged into the lead on the first lap of Saturday’s race, sticking to the inside of Turn 1 as other competitors struggled in slightly damp conditions. Morad led from the restart before a bump-and-run pass by the second-place competitor a few laps later dropped him to a third-place position he would hold to the finish. Starting Sunday’s second and final sprint from third on the grid, Morad moved up to second at the race start before giving way to the third-place competitor near the halfway point. He was positioned to make a move on the two leaders as they battled up front but never had the opportunity as the second half was plagued by three race-slowing caution periods, including a final contact incident that brought the race to an earlier-than-scheduled end. Despite missing the chance to make a final move on Sunday, Morad and the CRP Racing team left St. Petersburg with a good tally of championship points to start the season after the double-podium showing. The Mercedes-AMG GT4 is eligible in the Pirelli World Challenge GTS class in 2018 and two of the new race cars were given their series debut by Robinson Racing and team drivers Gar Robinson and Shane Lewis. Both Robinson Racing drivers recorded top-10 finishes in the GTS Pro class in each of the weekend’s races, with a fifth-place finish on Saturday by Lewis in the No. 72 Mercedes-AMG GT4 as the team’s best showing in the St. Petersburg doubleheader. Next up for Mercedes-AMG Motorsport Customer Racing teams is the 66th Annual 12 Hours of Sebring, March 15 – 17. Mercedes-AMG GT3 teams will compete in the featured 12-hour IMSA WeatherTech SportsCar Championship sprint race while Mercedes-AMG GT4 teams will race in Friday’s IMSA Continental Tire SportsCar Challenge event. The Pirelli World Challenge 2018 schedule continues March 23 – 25 at Circuit of The Americas (COTA) in Austin, Texas where Mercedes-AMG GT3 and Mercedes-AMG GT4 teams will contest the opening rounds of the SprintX GT and GTS championships. Daniel Morad, Driver – No. 2 CRP Racing Mercedes-AMG GT3: “Before the Saturday race started, there was a light drizzle. We opted to go on scrubbed tires, and that seemed to play a huge factor on the start for our Mercedes-AMG GT3. While everyone slid on the runway paint, I was able to tuck on the inside of Turn 1 and pass four cars. I emerged in the lead, and after a long safety car period, I stayed in the zone and was able to work up a gap. Shane Lewis, Driver – No. 72 Robinson Racing Mercedes-AMG GT4: “This weekend is really due to the hard work of the Robinson Racing guys. The first time we ever drove these cars was two days before we got here to St. Petersburg. We had to learn the basics of the Mercedes-AMG GT4 and we are glad to come out of here relatively unscathed. Marshall Pruett Asks Racecar Drivers & Insiders: Who The Hell Are You?